The most dependable turkey hunter around. Combine deadly precision with incredible maneuverability and time-tested Remington® craftsmanship, and you've got this Model 870® SPSTM. With the ShurShotTM ambidextrous pistol grip you'll have the utmost stability when you've got game in your view, and the pre-mounted Red / Green Dot Scope brings the added accuracy you want. Add in full Mossy Oak Obsession® concealment, and those turkeys won't know what hit 'em. 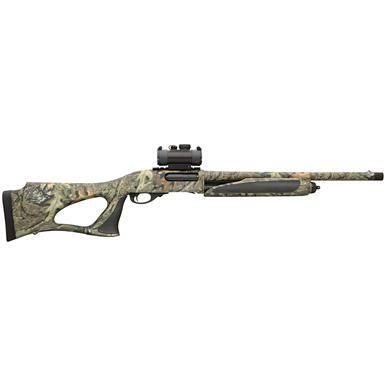 Remington 870 SPS ShurShot, Pump Action, 12 Gauge, 20 Barrel, 30mm Scope, 5+1 Rounds is rated 5.0 out of 5 by 1. Rated 5 out of 5 by zatstuff from Great shotgun at a great price. What a nice shotgun this is. Turkey season hasn't started here yet, but after removing the red dot, and using different chokes that came with a longer barreled 870 that I have, I've already shot several rounds of trap and sporting clays with it. Then after fastening the red dot back on, shot several slugs to sight it in at fifty yards. I loved the way it handles, i.e. it's shortness and balance and smooth operation. Here in Iowa, it'll now be my go to turkey, deer and pheasant gun.